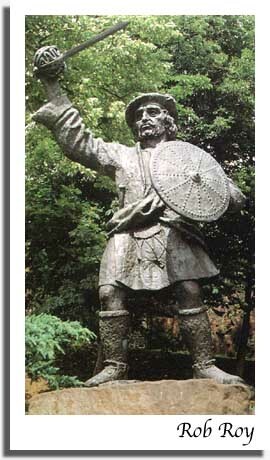 Robert MacGregor known as "Rob Roy" was born at Glengyle, at the head of Loch Katrine in 1671. His name is anglicised from the Gaelic Raibert Ruadh, or Red Robert because he had red hair, which darkened to auburn in later life. He was the third son of Lieutenant-Colonel, Donald Glas of Glengyle, a chieftain and his mother was Margaret Campbell. He had two brothers Iain and Duncan. He was baptized on 7th March 1671, as proved by an extract from the Register of Baptisms of Buchanan Parish. Like any Highland boy of good family, young Rob Roy MacGregor's education came from within his community, where nightly ceilidhs included games designed to strengthen the oral tradition and a child's grasp of Highland history. His knowledge of literature as well as politics was considerable, particularly in a time when illiteracy was common. He was taught the skills that Highland cattle owners needed. Most importantly, his father, chief Donald Glas ensured that his children know their clan's history and it was this aspect of his education that would most greatly influence Rob Roy's place in history. Along with many Highland clans, at the age of eighteen Rob Roy went to battle with his father to support the Stewart King James against his challenger, William of Orange. He fought at Killiecrankie for Viscount Dundee in 1689 before joining the Lennox Watch. Although victorious in initial battles, the clans' leader was killed and their fortunes fell. Rob's father was taken to jail, where he was held on doubtful treason charges for two years. Rob's mother Margaret's health faltered and then failed during Donald's time in prison. By the time Donald was finally released, his wife was dead, and his reason for living also gone. The Gregor chief would never return to his former spirit or health. In his early twenties, Rob worked with his brother's cattle watch and developed his own trade in cattle. He married his sweetheart, Mary Helen MacGregor of Comar, born at Leny Farm, Strathyre. They were married in Glenarklet in January 1693, according to Buchanan Records. They had four sons (records show). They were James, known as Mor, or Tall; Ranald; Coll; Robert, known as Robin Oig, or Young Rob. A cousin Duncan was adopted. For his whole life, Rob had weathered the seasonal challenges and political threats under his parents' protection. Now, his parents and the way of life his clan had relied upon was being swept away by political winds from as far away as London and France. And his own political convictions were being formed. From this point, Rob Roy's convictions were formed. He despised needless bloodshed, and fought against the injustice that plagued his clan -- aggressively but with foresight. He was to become a hero of the Highlands. Rob Roy became War Leader of the clan, which entitled him to wear the three eagle's feathers of a chief. The MacGregor name was outlawed in 1694 and he used his mother's name. His acquisitions of land and cattle brought him prosperity until 1711 when he persuaded a group led by the Duke of Montrose to advance him £1000 for investment in herding. His chief drover made off with the letters of credit, leaving MacGregor to face a charge of embezzlement. He did not answer to the charge or ensuing arrest warrant and was declared an outlaw. He moved to the Trossachs lands of the Earl of Breadalbane, who was no friend of Montrose, and from there rustled cattle from Montrose's lowland estates. In the Rising of 1715, he mustered the Clan Gregor to fight for the Jacobites. He led his men in successful raids around Loch Lomond and Callander. Despite his inactivity during the Battle of Sheriffmuir, he was charged with High Treason. From 1716 he lived at Glen Shira on the Duke of Argyll's land. He was twice captured and twice dramatically escaped with style that added to his fame. In 1725, following his decision to turn himself in to General Wade, he received a pardon from the King and after thirteen years was no longer an outlaw. He died in his house at Inverlochlarig Beg, Balquhidder, on 28th December 1734 at the age of 63. It was reported in the Caledonian Mercury newspaper and one week later in Edinburgh. He is buried in Balquhidder Kirkyard, confirmed by information given by his descendants to the Clan Gregor Society. The detail on the ornamental bronze rail round his grave gives his age wrongly as 70. He was 63. (Picture courtesy of Cheryl Moore - May 2002). The decendants of Rob Roy are listed as follows: James had 14 children recorded; Coll had a son and daughter recorded; Ranald married his cousin Jean, daughter of MacGregor of Glengyle and the Glengyle line descended from them; Robin Oig's wife died young and there are no records of legitimate descendants from him. But many persons alive now claim to be descents from Rob Roy.